Non-aligned Personnel of Alien species. Thief. Assassin. Order - Return this personnel to his owner's hand to kill an opponent's Honor personnel present. Thief. "You will die far quicker than your son did, Kang. 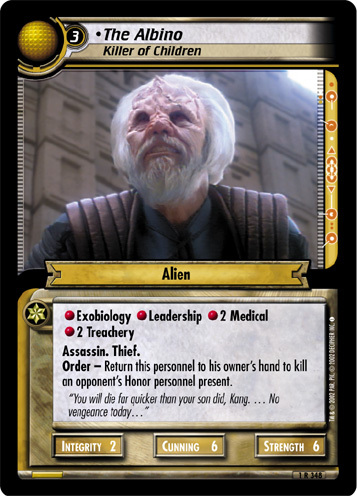 ...No vengeance today"
Characteristics: "relocate" personnel cards - return to hand, kill opponent's personnel, "affiliation", Assassin, Thief, personnel who has a cost of 3 or more, Alien species. There are 20 entries for The Albino, Killer of Children (ST2E 1 R 348) at the Tradeplace (11 haves and 12 wants). Click here to see all trade list entries for this Rare card!